On Thursday, Greenwich Police held a promotion ceremony for Sergeant Eric Scorca who was promoted to the rank of Lieutenant and Detective Richard Stook, promoted to Sergeant. Heavey said the two had a combined 35 years of experience, making significant arrests and saving lives as Greenwich Police officers. 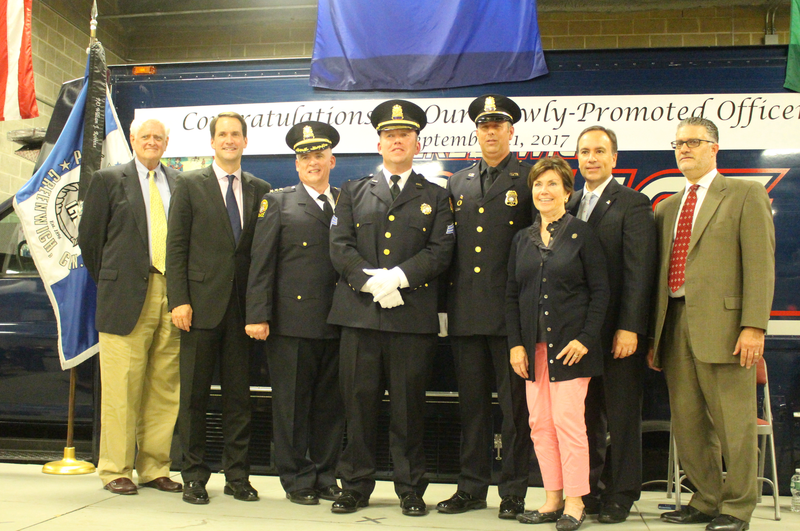 “Both Richard and Eric have clearly demonstrated their abilities in law enforcement,” First Selectman Tesei said, adding that present for the ceremony were representatives from local, state and federal government, including US Congressman Jim Himes who is a resident of Greenwich, state representative Livvy Floren and selectman John Toner. There were also members of Greenwich’s Fire Dept including members Assistant Chief Kick and crew from Station 1. “Everyone in this room are champions of the Greenwich Police Dept, but you don’t have to take our words for it,” Tesei said, adding that in the recent citizen satisfaction survey residents ranked both police and fire departments at the highest levels. Lieutenant Scorca, whose brother Officer Keith Scorca is partnered with K9 Kato, graduated from Western Connecticut State College where he received a BS degree. He became police officer in 2002 and has been a field training officer master police officer and field officer. Scorca was promoted to sergeant in 2009, holding positions as patrol sergeant, training sergeant and technical sergeant. Sergeant Scorca has been recognized throughout his career for his outstanding achievements and actions in the line of duty, including numerous awards for lifesaving investigations and meritorious actions. He was chosen as October 2016 officer of the month and won the 2017 John Clark award. Detective Rich Stook, who was promoted to Sergeant graduated from West Virginia Wesleyan College, where majored in sociology and government, and minored in Spanish. He became a police officer in Sept 1997 and has served as an accident investigator,, master police officer, field training officer, working mainly on the west side and central areas of town. He was assigned to the community impact section in 2008. He was assigned to the detective division 2009 where he worked until present. In the detective division he primarily worked in the narcotics section, and in 2013 he was assigned to the Drug Enforcement Administration’s task force in New Haven where he worked undercover in numerous operations involving trafficking of heroin. He has investigated numerous heroin and fentanyl deaths in Connecticut, and recently investigated cases involving the Internet’s dark web. Sergeant Stook was part of the department’s special response unit for 14 years, and has been a member of the honor guard since 2009. Sergeant Stook has been recognized throughout his career for his outstanding achievements and actions in the line of duty. He was officer of the month in March 2007, July 2010 and April 2011. He received a prestigious award from the US Attorney’s office in 2016, and is on the board of Directors for the Narcotics Enforcement Association of Connecticut, and has been member of the honor guard since 2009.